Following the mutinies in the French army in April 1917, it was clear that any major offensive on The Western Front in the Summer and Autumn of that year would have to be carried by Britain. Douglas Haig, the British commander, had long wished to launch an offensive in Flanders at Ypres. A successful attack at Ypres would, he believed, allow British forces to break through the German lines and advance to the Belgian coast and capture important ports being used by the Germans as U Boat bases. Germany had begun an unrestricted U Boat campaign in February, sinking any ships sailing to Britain on sight and thus threatening Britain’s ability to continue the war. Before the main offensive at Ypres took place, Britain had launched a highly successful attack on The Messines Ridge on 7th June. This attack was on a small scale compared with other First World War battles, but the success encouraged Haig in his belief that he could be successful in a major offensive. The Messines Ridge is an area of high ground to the South of Ypres and in 1917 it was held by the Germans. After a period of meticulous preparation and planning, the British Second Army, commanded by Plumer, captured the ridge with low casualties. The attack had been preceded by an artillery bombardment in which three and a half million shells had been fired. Another secret of the attack’s success was the use of 19 mines dug underneath the German positions, which had been used to explode a million pounds of explosive. Launching a major offensive at Ypres would be much more difficult and the planned British attack faced massive problems. The Germans held virtually all of the high ground surrounding the town and had constructed some of the strongest defences on The Western Front. There were multiple layers of defences, consisting of trenches, breastworks, fortified shell holes, barbed wire, concrete bunkers, dugouts and machine gun pill boxes. In addition to this the area had been totally devastated by over three years of fighting. The ground was a mass of shell holes and the drainage systems, built in the area over centuries, had been destroyed. The area was notorious for wet weather and any rain would turn the battlefield into a quagmire. The British attack on 31st July 1917, which began The Third Battle of Ypres, had been preceded by an artillery bombardment of 15 days in which four million shells were fired. The attack was also supported by 136 tanks. Though there was some success, particularly the capture of The Pilkem Ridge, the attack made little progress and casualties soon began to mount. Rain began to pour down, the Germans began a massive artillery bombardment against the attacking troops and the battlefield turned into a sea of mud. Haig was, however, determined to press on. The conditions made getting men and supplies to the front enormously difficult and conditions became appalling. 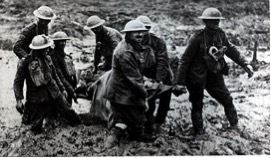 Men often went straight into action after wading through mud for hours to get to their trenches. The difficulty in getting across No Man’s Land meant that the artillery barrage often moved on ahead of the attacking troops struggling through mud, leaving them exposed to machine guns. Wounded soldiers who had crawled into shell holes drowned as they filled with water. August saw little success, but in September the Germans were pushed back yard by yard. Battles took place to gain objectives whose names became unforgettable; The Menin Road, Polygon Wood, Gheluvelt, Broodseinde. Each side suffered heavy casualties from the intense artillery bombardments that preceded each British attack and each German counter attack. By October pressure was mounting on Haig to end the offensive, but he was convinced that one more blow would see German resistance break. In October and November the final battles took place for the high ground around Passchendaele. The site of the village, which by now had completely ceased to exist, was captured by Canadian troops on 10th November. The Battle of Passchendaele (Third Battle of Ypres) has shaped many people’s image of World War 1. It is an image of soldiers wallowing in mud, fighting in impossible conditions and making pointless sacrifice on a massive scale. The British army lost 70,000 dead and 170,000 wounded and the German army lost a similar number. It is difficult to see what the battle achieved; there was no breakthrough and although battered, the German army was well capable of continuing the war as 1918 was to show.